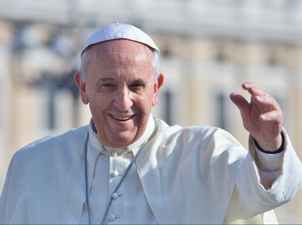 In his recently-published apostolic exhortation “Rejoice and Be Glad,” Pope Francis explores what it means to be holy in a world often tainted by egoism and a disregard for the marginalized. He calls us all to follow Jesus in order to embody His holiness and live out His mission in the world. In one section of the apostolic exhortation, Pope Francis lists the “signs of holiness in today’s world:” Perseverance, Patience and Meekness, Joy and a Sense of Humor, Boldness and Passion, Community, and Constant Prayer. What do these mean, and how do they apply to our own lives and our advocacy? Working for justice can be draining. I am always amazed by our lobbyists who constantly advocate for policy goals that may or may not be realized. It is difficult to measure how much one lobby visit or one conversation can influence a policy maker. While our lobbyists might not feel immediate satisfaction from their actions, they continue to do this work because they are hopeful that through advocacy we will move towards a more positive future. As we continue in our work for justice, it is important to look towards our ultimate goal to avoid being weighed down in moments of distress. In our political climate it can be hard to find joy, let alone a sense of humor. The current administration makes daily decisions that threaten the livelihood of our sisters and brothers both in the United States and across the world. In the face of this adversity, it is important to cultivate the inner sense of joy and positivity we need to move forward. At NETWORK, I find joy in my co-workers, who find time to engage with one another in meaningful ways even when they are bogged down with hill visits, or grassroots organizing. I also find joy in the hope that our work will contribute to promoting the common good and dismantle the oppressive systems currently in place. It’s a human tendency to think we can do everything on our own. Sometimes it feels easier to do it that way instead of consulting our sisters and brothers for help. However, in our work for justice, we must always seek out our neighbors. Our Grassroots Mobilization team constantly puts this into action by building advocates teams across the United States and mobilizing them to be active voices in their communities. We also see this sense of community in our spirit-filled network at NETWORK that participates in action alerts, webinars, and more. Without them, out work would not be possible. Another key part of advocacy is building relationships with other organizations advancing justice and lifting up the work they are doing. At NETWORK we work on our Mend the Gap issue areas, but we can only cover so much! Without the great work of our partner organizations, the uphill battle towards economic and social justice would be a lot more challenging. When we recognize the value of community, we are all able to combine our unique strengths to work towards a common goal. Pope Francis emphasizes the importance of discernment by asking, how do we faithfully follow God? Being in prayer with God means being in conversation with Her and asking where do you most need me? Although this can be unclear, only in talking to God can we ensure that we are doing all we can to live out Her mission. A huge part of our work for justice requires listening and bearing witness to what is going on around us. We must occasionally set aside doing and focus on openness: letting God’s will enter our hearts and our minds. We have to remind ourselves of why we are doing this work. Only then can we ensure we are truly living out God’s call for us. Overall, there is a lot to take from the pope’s apostolic exhortation. Pope Francis assures us that we are all called to be holy in our own unique way. The “signs of holiness” are the means through which we can animate our advocacy and achieve holiness in our lives. This entry was posted in Emerging Justice Seekers, Front Page, Staff on April 26, 2018 by maryc.